With alarming speed another month had rolled around with little time for personal adventure in among the long hot days that had been filling my time since a stolen night at the end of April. I was overdue a night out now having missed a month and was starting to get restless. The diary was busy and only seemed to be getting busier. I hadn’t managed to spend much quality time with my wife lately and I was more aware than ever that we needed some time away, even if only a night. This was the excuse I had been waiting for. My Aunty and Uncle have been holidaying in Connermara for the last five or six years with there sailing boat and camping on a lovely campsite right on top of the cliffs near some picturesque beaches and coastline. They had suggested we join them as soon as we announced we were moving to Dublin the previous summer. I had heard the stories and seen the photos and was filled with the childlike sense of excitement I have come to enjoy in the build up to camping trips. There was also added joy and excitement this time as Katie, my wife, was also able to join me for the trip. This was music to my ears. I had secretly been considering this in my planning for the trip but didn’t want to push myself too hard and was aware I wanted it to be an enjoyable and relaxed experience for Katie. I hurried home at the end of the day going via the traditional shop for beer and things you can cook using only one pot. Before we knew it we were on our way and heading back to the West of Ireland for what was only the second time since we arrived nearly a year before. 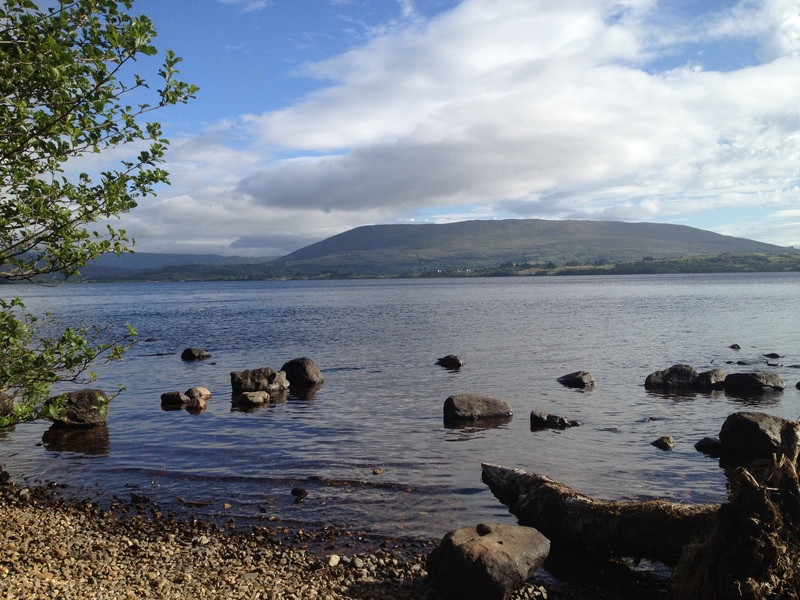 A friend at work had previously mentioned to me that Lough Corrib was a great place for walking and wild camping. Sitting roughly half an hour north of Galway it seemed to be the perfect place to aim for when looking for our home for the first night. We arrived in Oughterard just after ten in the evening giving us roughly an hour of day light to find somewhere to camp and get the tent up before dark. Over the last ten years I have had the privilege of having camped in many places, in many countries in tent, bivi and van on campsites and hillsides and on occasion even a few more bizarre places. 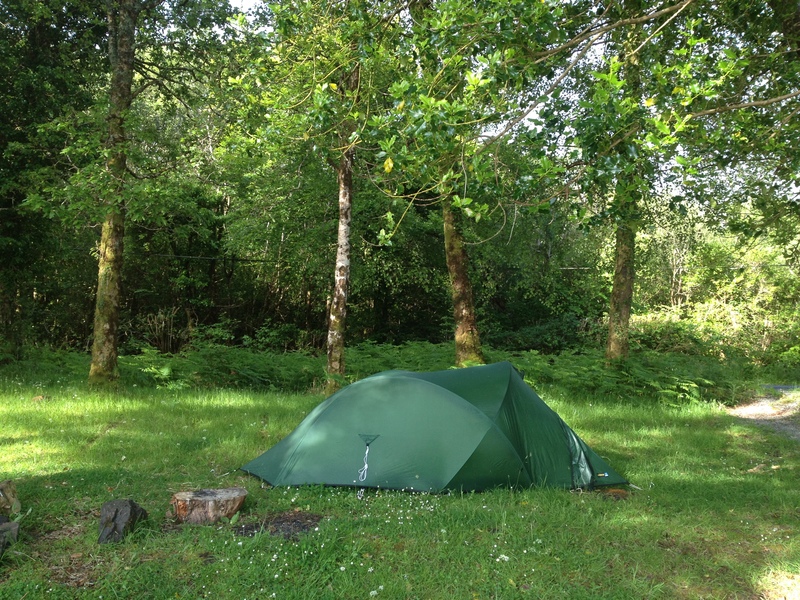 Out of all of these the one that sits least well with me is the idea of roadside wild-camping. Maybe it is simply that I have less experience of this than other styles of camping. However I still have a slightly uncomfortable feeling that being next to a road, however remote, and outside of a van, I am a little more accessible and therefore vulnerable than I like. The reality of this is that I probably have too much of an overactive imagination. I’ve camped like this quite a few times now all without incident. I do however strongly recommend making sure that you turn up late and leave early. This way I think you are less likely to upset any locals or draw too much attention to yourself. 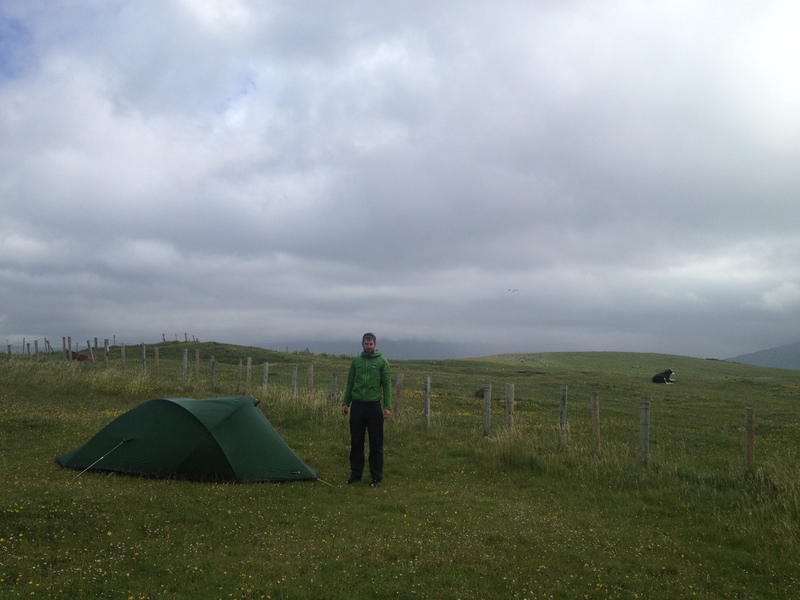 I would also recommend keeping to the general rules of wild camping and making sure you are not in view of any buildings, unless of course you have asked permission, and in my experience the quieter the road the better. After a short drive we found a wonderful lay-by with a picnic bench or two and a nice small grassed area with a few trees near the lake-shore. It looked like it hadn’t seen much TLC in a while and seemed like it was well off the radar in terms of being disturbed. After a quick walk around and inspection for a suitable flat bit I pulled out the tent and started pitching. At roughly the same time, what I can only describe as a small army of midges, that would make their Scottish cousins proud, descended upon me. 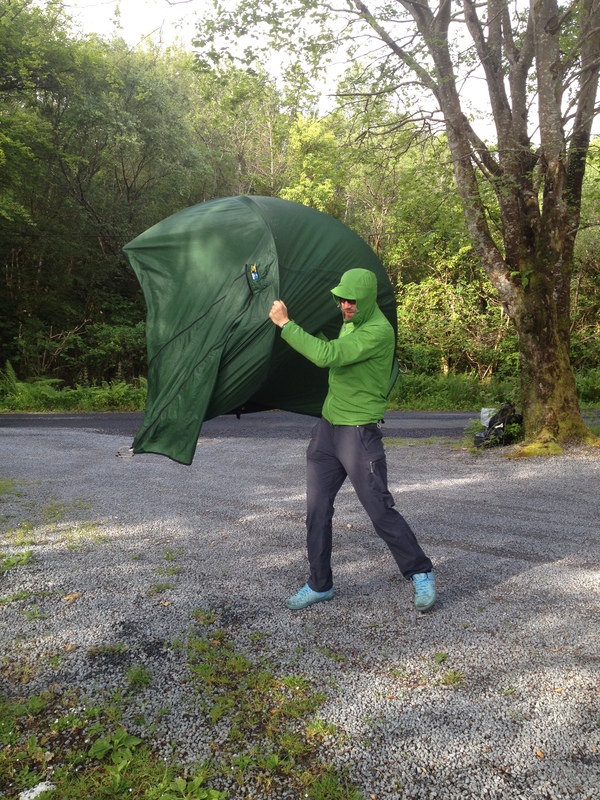 I am no stranger to the midge, having traveled in the wilds of Scotland and spent two summers working in a the Canadian wilderness during midge season I know them well enough to know two things; I hate midges and that I have a mild allergic reaction to their bites. It was also at this moment that I remembered my trusty anti-midge cream was sat at home. In a moment of heroics and illogical manliness, I ordered Katie to the car for protection while I stayed and finished putting up the tent. After much laughter and being given a hard time by Katie due to the apparently hilarious theatrics that are witnessed when watching a man battle an army of midges from a safe distance, Katie finally agreed to take my plans seriously as I explained how we would need to to enter the tent with both speed and military precision in order to keep the midges out for the night. 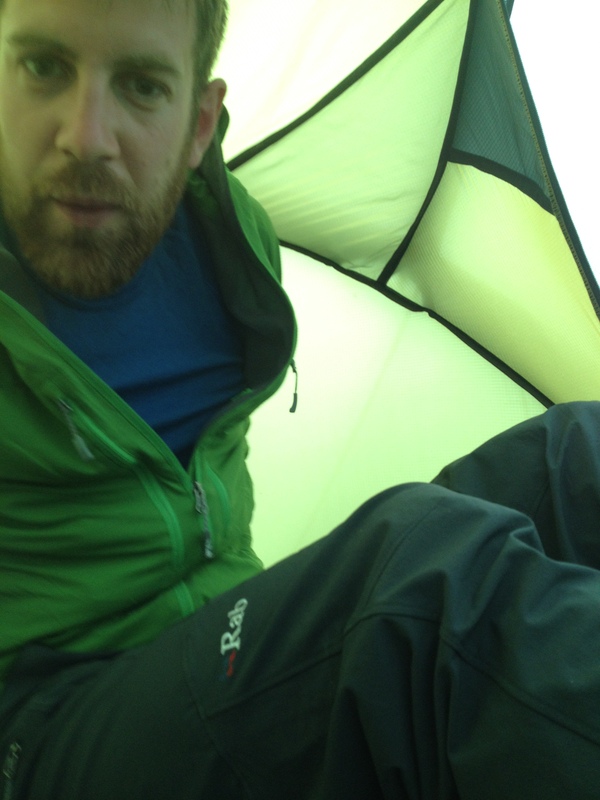 After a successful entry to the tent we both settled down and enjoyed a comfy and refreshing nights sleep. In the morning we awoke early, full of excitement and joy at the thought of another days adventure, seeing my Aunty and Uncle and the possibility of a trip on a sailing boat. It was at this point Katie spotted the midges on the outside of the tent. After initially being dismissive and thinking she was now only seeing what I had encountered last night, I realised she actually had a point. The army of midges had clearly called for reinforcements and I would have put money on the fact almost every midge in Ireland was now outside waiting for us. After a very speedy exit and some more humorous waving around of a tent to get the midges out we were back in the car and on our way to Clifden, all thoughts of breakfast having been abandoned for the time being. 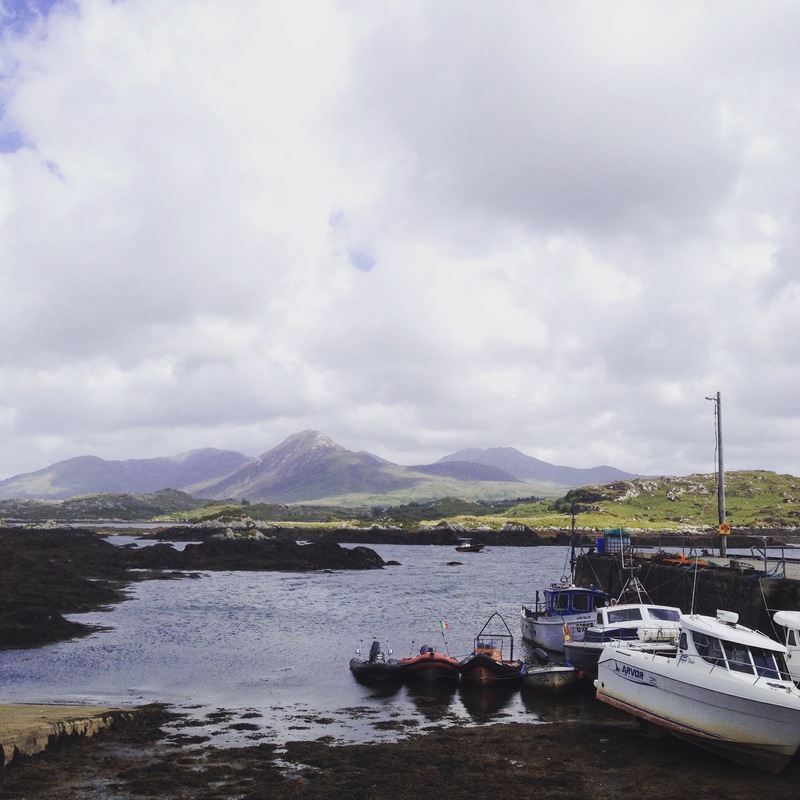 After a lovely drive through the Connemara National Park we arrived to find a lovely and idyllic campsite perched on the top of the cliffs over looking the coastline. It was obviously a small and very well kept site with a handful of tents and camper vans scattered across the field. In no time at all we found my Aunty and Uncle and were drinking coffee and eating a much needed breakfast of ham and eggs in the comfort of their van. After an hour or so of coffee and relaxing we decided it was time to see if the weather would be kind and to see about the possibility of venturing out in the boat. My Aunty and Uncle are both passionate sailors and I have fond memories of visiting their local sailing club in Llangorse as a child and spending an evening sailing with my cousins. I have sailed a few times with friends in the lakes and whilst I have a basic understanding of wind and dingy sailing I wouldn’t recommend that you lend me a boat. The idea of a day out with experienced sailors filled me with joy. There was also an added element of adventure to the trip for me venturing from the relative safety of lakes and powerboat support to one of the most impressive wilderness in the world; the sea. As we arrived to the small remote fishing harbor where the boat was already on the water the coastline looked wonderful and inspiring with its combinations of greens and yellows coming down to meet the greens and blues of the sea. As we arrived to the small remote fishing harbor where the boat was already on the water the coastline looked wonderful and inspiring with its combinations of greens and yellows coming down to meet the greens and blues of the sea. 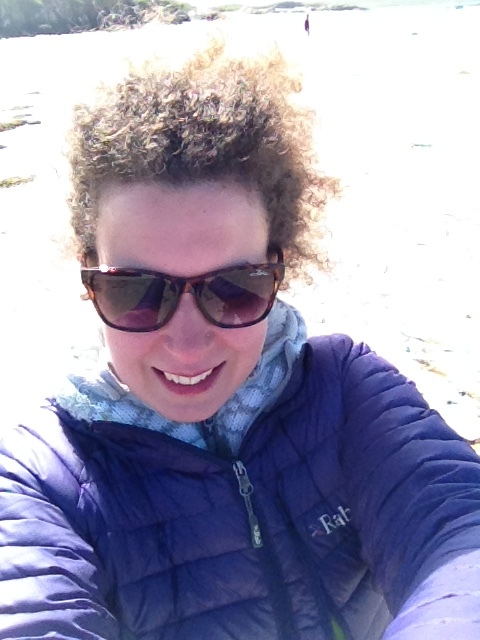 The wind was blowing and I could tell straight away that the sea was rough. My uncle took a look and announced to the rest of us that we would head out to the boat and take a look to see what the conditions were like. As we got changed and readied the tender to make our journey across to the boat the wind seemed to drop slightly and the sun was seen to make an appearance. Half an hour later we were motoring up the bay and on our way to an afternoon of adventure. Sailing boats seemed to have always been a mainstay of the childhood books I read that captured my imagination so long ago. Having never lived near the coast, the sea and in particular boats and islands still excite me and stir in me those same feelings I remember feeling as a child sat in bed reading books at bedtime. What followed was one of the most enjoyable afternoons I have experienced in some time. The wind was consistent, the waves were kind and we all had great fun taking it in turns to steer, eat and catch up as the boat carried us through the wind and the waves. Before I knew it three hours had passed and it was time for us to head back in. With a smile on my face and salt in my hair we returned to land feeling a million miles away from our busy lives back in Dublin. After a lovely fresh fish supper in the local pub and a midge free night back in the tent all that was left was the drive home. After saying our goodbye’s to my Aunty and Uncle we drove back, happy, tired and excited, dreaming up future plans and adventures for the summer that lay ahead. Katie had enjoyed herself and seemed to have rediscovered the love for family camping trips she had enjoyed when she was younger. We arrived back into Dublin mid-afternoon and it was hard to believe that so much had happened in the 36 hours we had been away. It has been a refreshing reminder to us that adventure and relaxation are never as far away as you think.